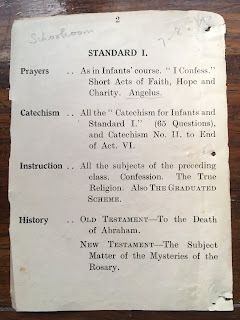 Do Today’s Catholic Adults Know As Much About Their Faith As Catholic Children Of The Past? 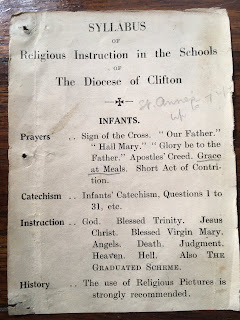 When the Convent of Poor Clares* in Woodchester, Gloucestershire, was due to close in May 2011, parishioners and friends of the nuns were invited to take books and religious artefacts to save them from being destroyed. 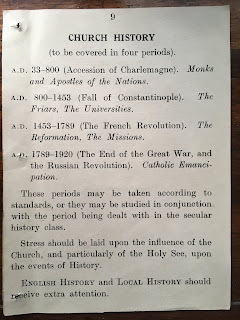 Amongst the many old books I acquired, I found a small homemade book by a nun called Sister Francis Agnes. 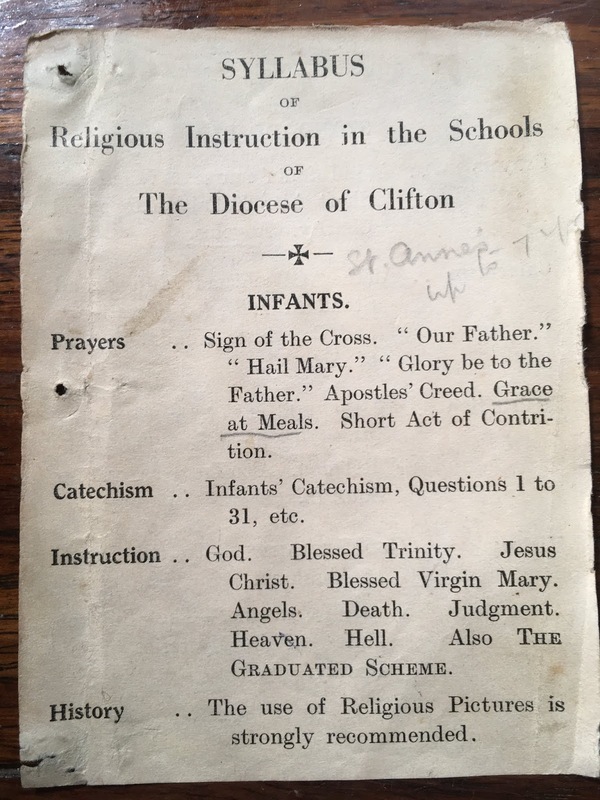 Within the book, I discovered a rare copy of an old, 12-page Syllabus of Religious Instruction in the Schools of The Diocese of Clifton which piqued my interest: I was fascinated to find out what I could have learnt about my faith had I been born two or three generations earlier. 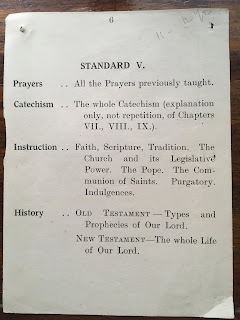 It is not a catechism but a scheme of work. 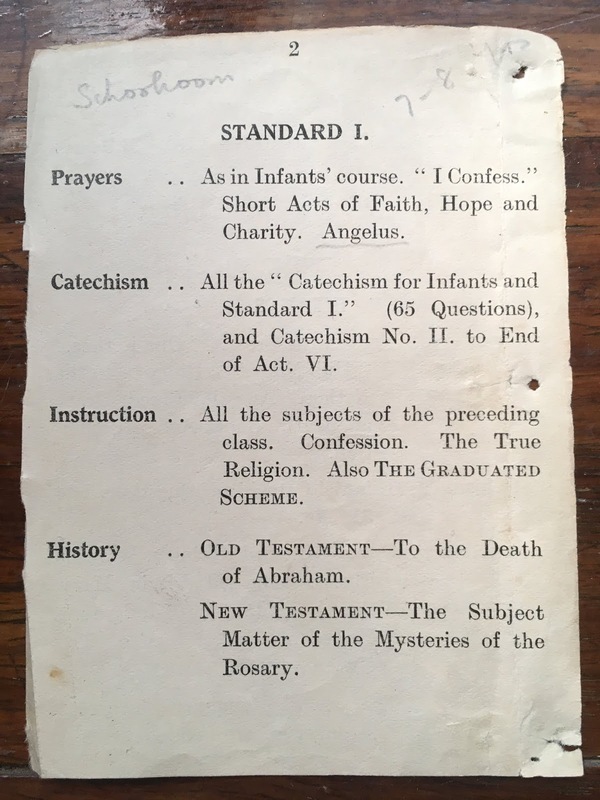 Many Catholics I know have the desire to preserve the treasures of their Catholic heritage that have been brushed under the carpet during the last 50 years by those wanting an ‘easier’ life, suppressing the more ‘difficult’ truths of the Faith. 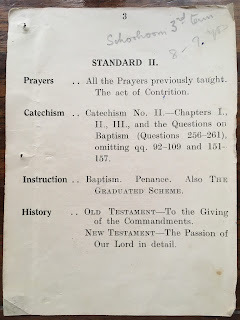 Reading through the syllabus, I immediately realised that my knowledge of the Faith was sadly less than that of a 13 year old of the 1930s/1940s, which is when the syllabus was published under Bishop William Lee. 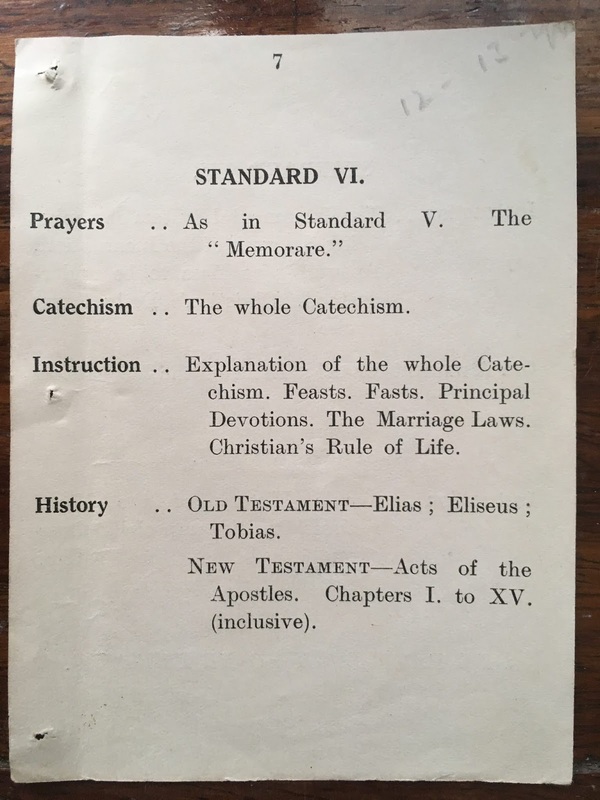 It uses the Catechism Of Christian Doctrine For Infants And Standard I, followed by The Explanatory Catechism Of Christian Doctrine. And so, before information such as this might be lost, it would be a good thing to promote it far and wide. 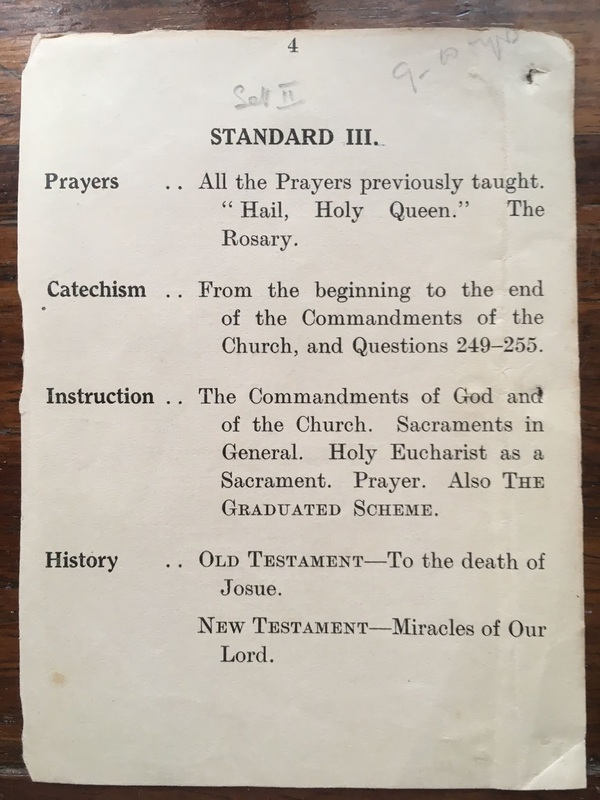 Please pass it on to whomever you think might be interested so that standards of Catholic education might be helped to be raised, and the knowledge passed on to future generations. 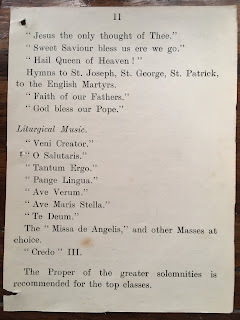 The TLM (Traditional Latin Mass) Survey was designed to parallel questions posed in previous research, allowing a direct comparison between the TLM attendees and those of the NOM (Novus Ordo Mass). 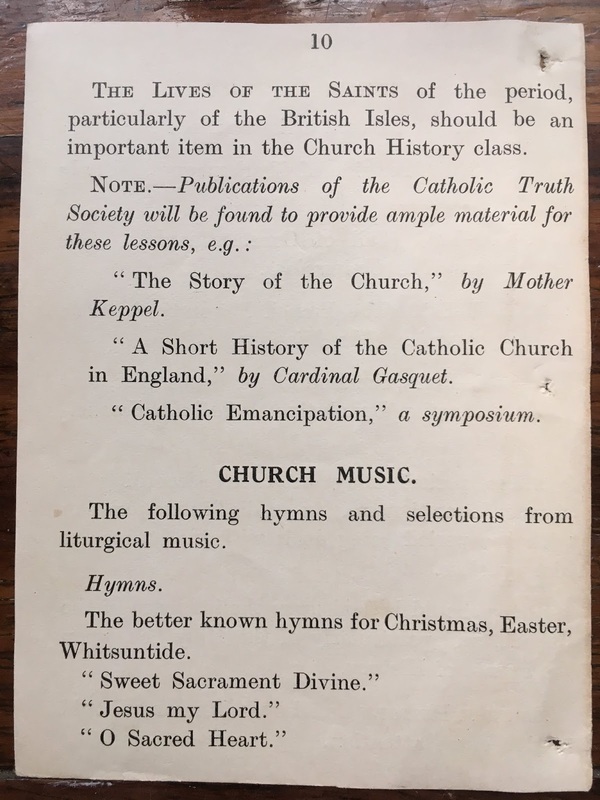 These were the topics:"
Robert Southwell also Saint Robert Southwell, was an English Roman Catholic priest of the Jesuit Order. He was also a poet and clandestine missionary in post-Reformation England. After being arrested and imprisoned in 1592, and intermittently tortured and questioned by Richard Topcliffe, Southwell eventually was tried and convicted of high treason for his links to the Holy See. 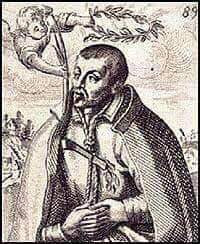 On 21 February 1595, Father Southwell was hanged at Tyburn. In 1970, he was canonised by Pope Paul VI as one of the Forty Martyrs of England and Wales. 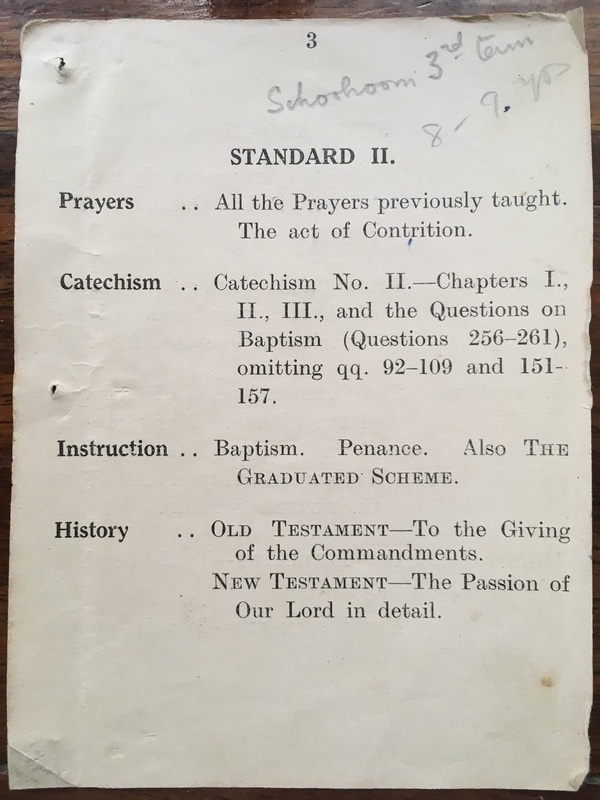 Saint Robert Southwell, S.J. (1561–1595). Line engraving by Matthaus Greuter (Greuther) or Paul Maupin, published 1608. Today is the feast day of St. Valentine! Valentine was a holy priest who lived in Rome in the third century. 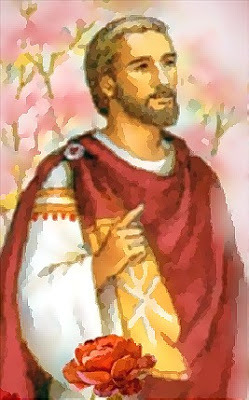 When Emperor Claudius II banned Christianity, Valentine helped and encouraged the Christians who faced martyrdom rather than give up their faith. It is said he even performed marriage ceremonies for Christian couples. Then Valentine himself was arrested. When he refused to give up his faith and worship the pagan Roman gods, he was put in prison. According to one legend, the official who imprisoned him had a blind daughter. Valentine cured her, and the official’s whole family became Christian. When Valentine was condemned to death, he wrote a farewell letter to the girl and signed it, “from your Valentine.” This could be where we get the custom of sending “Valentines” on February 14. St. Valentine was beheaded on February 14 in the year 269 or 270. He was buried on the Flaminian Road, where a basilica, a large and beautiful church, was built in 350. Some people think the custom of sending valentines grew from a belief in the Middle Ages that birds began to choose their mates on February 14. But the best reason for honoring St. Valentine as the patron saint of love is his own great love of God, which never weakened even at the cost of his life. Labels: Today is the feast day of St. Valentine! I'm the EF calendar. The epitome of the Faith of all Christians is found in the confession of the Most Holy Trinity. We have become disciples of Jesus, children and friends of God by being baptized in the name of the Father and of the Son and of the Holy Spirit. The distinction of the three persons in the divine unity (CCC 254) marks a fundamental difference in the belief in God and the image of man from that of other religions. Religions disagree precisely over this belief in Jesus the Christ. He is true God and true Man, conceived by the Holy Spirit and born of the Virgin Mary. The Word made flesh, the Son of God, is the only Savior of the world (CCC 679) and the only Mediator between God and men (CCC 846). Therefore, the first letter of John refers to one who denies His divinity as an antichrist (1 John 2:22), since Jesus Christ, the Son of God, is from eternity one in being with God, His Father (CCC 663). We are to resist the relapse into ancient heresies with clear resolve, which saw in Jesus Christ only a good person, brother and friend, prophet and moralist. He is first and foremost the Word that was with God and is God, the Son of the Father, Who assumed our human nature to redeem us and Who will come to judge the living and the dead. Him alone, we worship in unity with the Father and the Holy Spirit as the Only and True God (CCC 691). Jesus Christ founded the Church as a visible sign and instrument of salvation realized in the Catholic Church (816). He gave His Church, which “emerged from the side of the Christ who died on the Cross” (766), a sacramental constitution that will remain until the Kingdom is fully achieved (CCC 765). 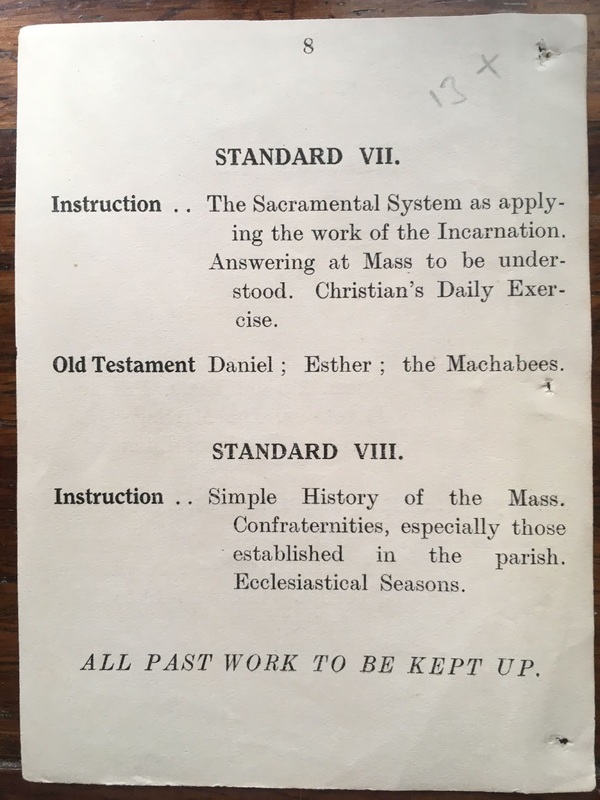 Christ, the Head, and the faithful as members of the body, are a mystical person (CCC 795), which is why the Church is sacred, for the one Mediator has designed and sustained its visible structure (CCC 771). Through it the redemptive work of Christ becomes present in time and space via the celebration of the Holy Sacraments, especially in the Eucharistic Sacrifice, the Holy Mass (CCC 1330). 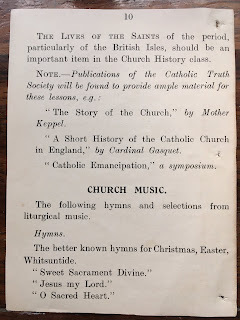 The Church conveys with the authority of Christ the divine revelation, which extends to all the elements of doctrine, “including the moral teaching, without which the saving truths of the faith cannot be preserved, explained, and observed” (CCC 2035). 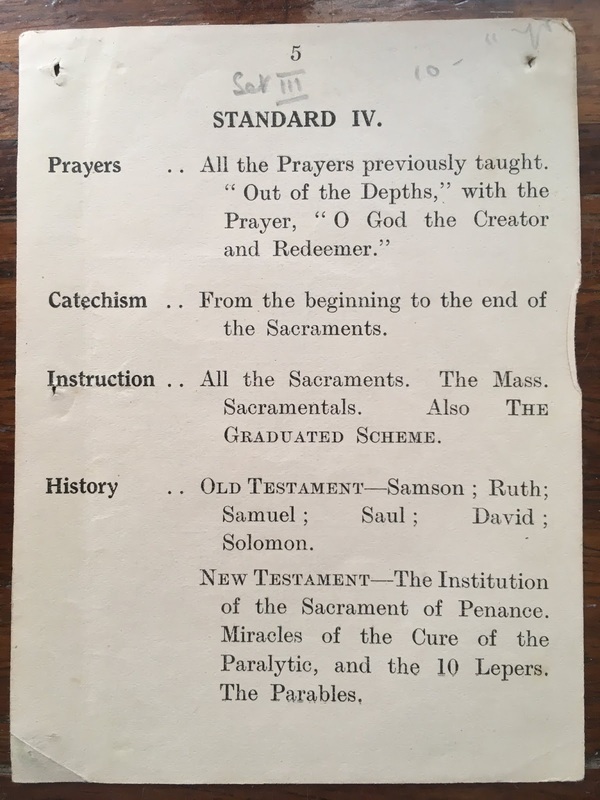 The Church is the universal sacrament of salvation in Jesus Christ (CCC 776). She does not reflect herself, but the light of Christ, which shines on her face. 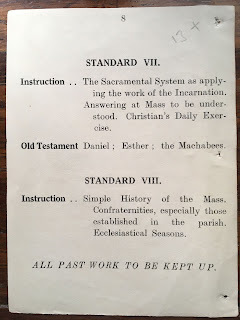 But this happens only when the truth revealed in Jesus Christ becomes the point of reference, rather than the views of a majority or the spirit of the times; for Christ Himself has entrusted the fullness of grace and truth to the Catholic Church (CCC 819), and He Himself is present in the sacraments of the Church. The Church is not a man-made association whose structure its members voted into being at their will. It is of divine origin. "Christ himself is the author of ministry in the Church. He set her up, gave her authority and mission, orientation and goal (CCC 874). The admonition of the Apostle is still valid today, that cursed is anyone who proclaims another gospel, “even if we ourselves were to give it or an angel from heaven” (Gal 1:8). 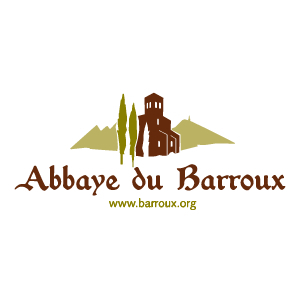 The mediation of faith is inextricably bound up with the human credibility of its messengers, who in some cases have abandoned the people entrusted to them, unsettling them and severely damaging their faith. Here the Word of Scripture describes those who do not listen to the truth and who follow their own wishes, who flatter their ears because they cannot endure sound doctrine (cf. 2 Tim 4:3-4). 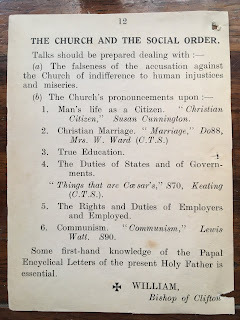 The task of the Magisterium of the Church is to “preserve God’s people from deviations and defections” in order to “guarantee them the objective possibility of professing the true faith without error” (890). 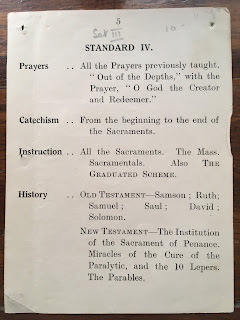 This is especially true with regard to all seven sacraments. The Holy Eucharist is “source and summit of the Christian life” (CCC 1324). The Eucharistic Sacrifice, in which Christ includes us in His Sacrifice of the Cross, is aimed at the most intimate union with Him (CCC 1382). Therefore, the Holy Scripture admonishes with regard to the reception of the Holy Communion: “Whoever eats unworthily of the bread and drinks from the Lord's cup makes himself guilty of profaning the body and of the blood of the Lord” (1 Cor 11:27). “Anyone conscious of a grave sin must receive the sacrament of Reconciliation before coming to communion” (CCC 1385). 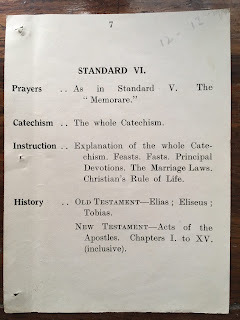 From the internal logic of the sacrament, it is understood that civilly remarried divorcees, whose sacramental marriage exists before God, as well as those Christians who are not in full communion with the Catholic Faith and the Church, just as all who are not properly disposed, cannot receive the Holy Eucharist fruitfully (CCC 1457) because it does not bring them to salvation. To point this out corresponds to the spiritual works of mercy. The confession of sins in Holy Confession at least once a year is one of the Church’s commandments (CCC 2042). When the believers no longer confess their sins and no longer experience the absolution of their sins, salvation becomes impossible; after all, Jesus Christ became Man to redeem us from our sins. The power of forgiveness that the Risen Lord has given to the Apostles and their successors in the ministry of bishops and priests applies also for mortal and venial sins which we commit after Baptism. The current popular practice of confession makes it clear that the conscience of the faithful is not sufficiently formed. God's mercy is given to us, that we might fulfil His Commandments to become one with His Holy Will, and not so as to avoid the call to repentance (CCC 1458). “The priest continues the work of redemption on earth” (CCC 1589). The ordination of the priest “gives him a sacred power” (CCC 1592), which is irreplaceable, because through it Jesus becomes sacramentally present in His saving action. Therefore, priests voluntarily opt for celibacy as "a sign of new life" (CCC 1579). It is about the self-giving in the service of Christ and His coming kingdom. With a view to receiving the ordination in the three stages of this ministry, the Church is “bound by the choice made by the Lord Himself. That is why it is not possible to ordain women”(CCC 1577). 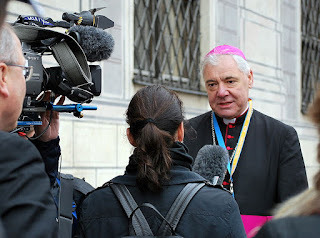 To imply that this impossibility is somehow a form of discrimination against women shows only the lack of understanding for this sacrament, which is not about earthly power but the representation of Christ, the Bridegroom of the Church. Faith and life are inseparable, for Faith apart from works is dead (CCC 1815). The moral law is the work of divine wisdom and leads man to the promised blessedness (CCC 1950). 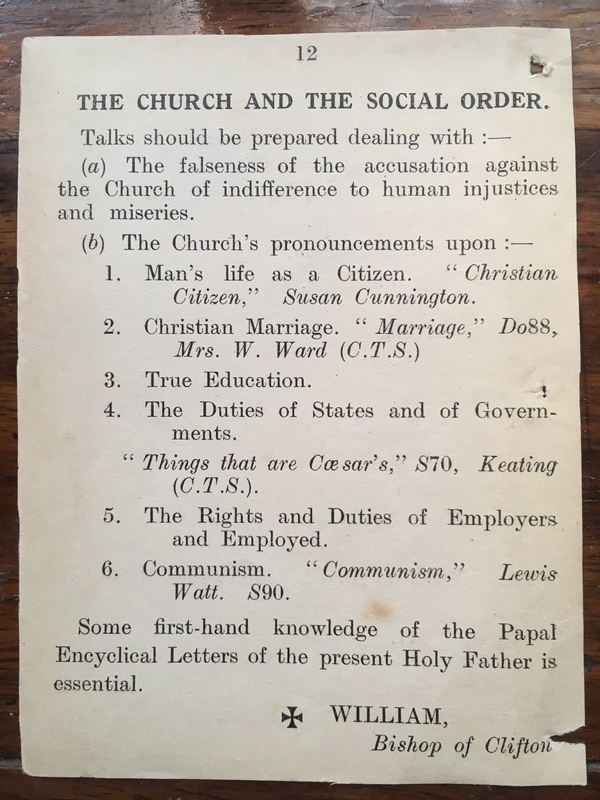 Consequently, the "knowledge of the divine and natural law is necessary" to do good and reach this goal (CCC 1955). Accepting this truth is essential for all people of good will. For he who dies in mortal sin without repentance will be forever separated from God (CCC 1033). This leads to practical consequences in the lives of Christians, which are often ignored today (cf 2270-2283; 2350-2381). The moral law is not a burden, but part of that liberating truth (cf Jn 8:32) through which the Christian walks on the path of salvation and which may not be relativized. Many wonder today what purpose the Church still has in its existence, when even bishops prefer to be politicians rather than to proclaim the Gospel as teachers of the Faith. The role of the Church must not be watered down by trivialities, but its proper place must be addressed. Every human being has an immortal soul, which in death is separated from the body, hoping for the resurrection of the dead (CCC 366). Death makes man's decision for or against God definite. Everyone has to face the particular judgement immediately after death (CCC 1021). Either a purification is necessary, or man goes directly into heavenly bliss and is allowed to see God face to face. There is also the dreadful possibility that a person will remain opposed to God to the very end, and by definitely refusing His Love, "condemns himself immediately and forever" (CCC 1022). “God created us without us, but He did not want to save us without us” (CCC 1847). 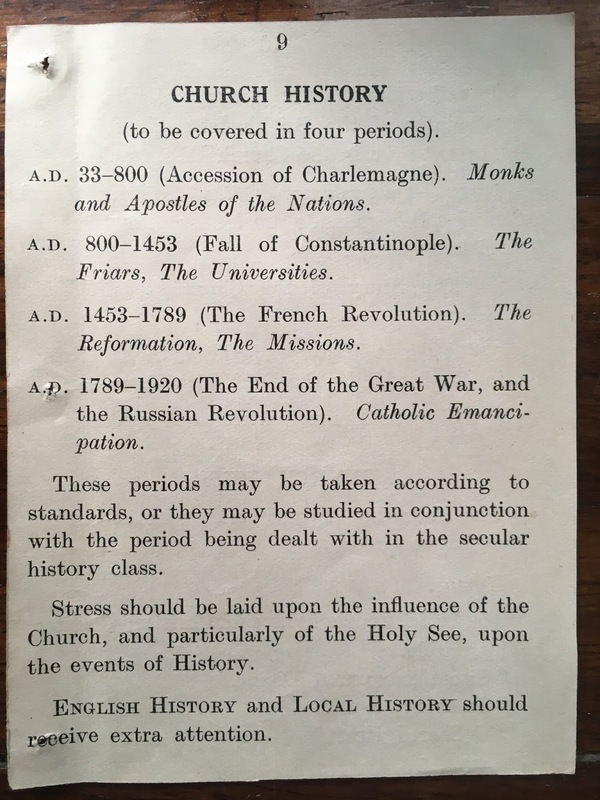 The eternity of the punishment of hell is a terrible reality, which - according to the testimony of Holy Scripture - attracts all who “die in the state of mortal sin” (CCC 1035). The Christian goes through the narrow gate, for “the gate is wide, and the way that leads to ruin is wide, and many are upon it” (Mt 7:13). 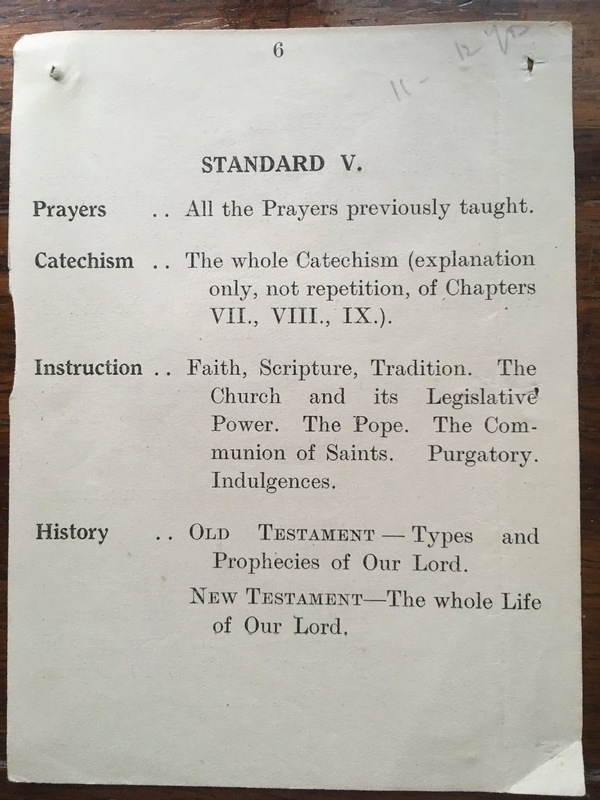 To keep silent about these and the other truths of the Faith and to teach people accordingly is the greatest deception against which the Catechism vigorously warns. It represents the last trial of the Church and leads man to a religious delusion, “the price of their apostasy” (CCC 675); it is the fraud of Antichrist. “He will deceive those who are lost by all means of injustice; for they have closed themselves to the love of the truth by which they should be saved” (2 Thess 2:10). As workers in the vineyard of the Lord, we all have a responsibility to recall these fundamental truths by clinging to what we ourselves have received. We want to give courage to go the way of Jesus Christ with determination, in order to obtain eternal life by following His commandments (CCC 2075). Let us ask the Lord to let us know how great the gift of the Catholic Faith is, through which opens the door to eternal life. “For he that shall be ashamed of me, and of my words, in this adulterous and sinful generation: The Son of Man also will be ashamed of him, when He shall come in the glory of his Father with the holy angels.” (Mark 8:38). Therefore, we are committed to strengthening the Faith by confessing the truth which is Jesus Christ Himself. We too, and especially we bishops and priests, are addressed when Paul, the Apostle of Jesus Christ, gives this admonition to his companion and successor, Timothy: “I charge thee, before God and Jesus Christ, Who shall judge the living and the dead, by His coming, and His kingdom: Preach the word: be instant in season, out of season: reprove, entreat, rebuke in all patience and doctrine. For there shall be a time, when they will not endure sound doctrine; but, according to their own desires, they will heap to themselves teachers, having itching ears: And will indeed turn away their hearing from the truth, but will be turned unto fables. But be thou vigilant, labour in all things, do the work of an evangelist, fulfil thy ministry. Be sober.” (2 Tim 4:1-5). May Mary, the Mother of God, implore for us the grace to remain faithful without wavering to the confession of the truth about Jesus Christ." Today is the Feast of Our Lady of Lourdes- AVE MARIA "OUR LADY OF LOURDES"
Labels: Today is the Feast of Our Lady of Lourdes- AVE MARIA "OUR LADY OF LOURDES"
"History enthusiasts and interested members of the community gathered at St Michael’s Centre on Wednesday, 23 January, to hear the results of an archeological survey of Abergavenny’s 17th century Plas Gunter Mansion, aimed at unlocking more of its historical secrets. 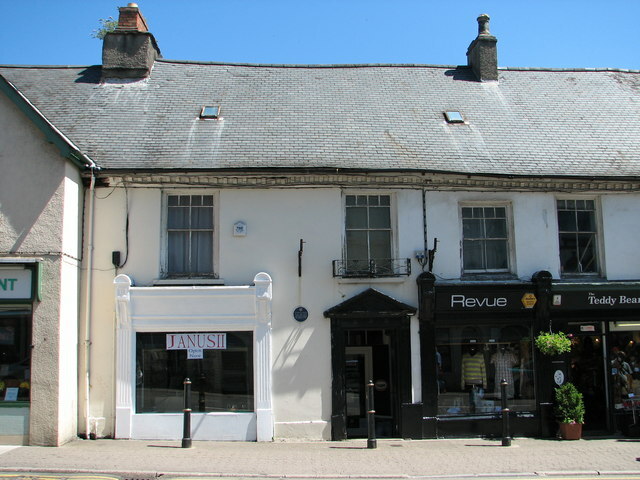 The Grade II* listed building, bought for the community by The Welsh Georgian Trust in 2017, is of historical importance because of the discovery of a secret chapel in the attic where Catholics worshipped during a period when it was illegal and dangerous to do so.It is the only known recusant chapel that exists in Wales and one of the best surviving examples in the whole of Britain. One of the priests who led the secret services was denounced to Parliament by priest-hunter, John Arnold of Llanfihangel Court. He was arrested, hanged, drawn and quartered at Usk on 27th August, 1679. Father – later Saint – David Lewis was Wales’ last Catholic martyr." For the whole article see:- https://www.plasguntermansion.org.uk/first-plas-gunter-mansion-survey-raises-more-questions-about-the-house-s-hidden-secrets. 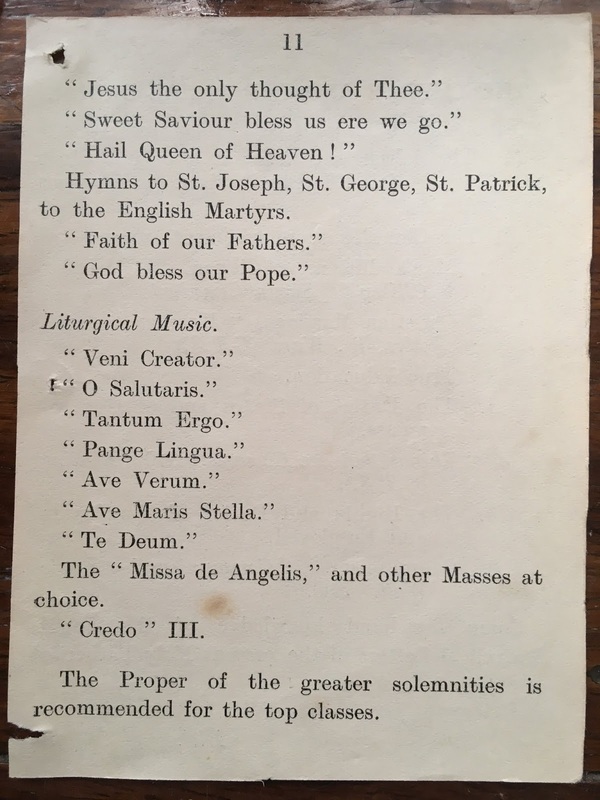 First of all remember that these five Saturdays simply needs to be done once in your lifetime and our Lady will assist you at your hour of death with the grace necessary for salvation. That is pretty amazing. The heart of Our Lady’s message is making reparation for others through communions. It is a rescue mission for others. Basically, you are taking the place of someone else (who is not going to Mass) by going to communion for them on Saturday. So you are going above and beyond your Sunday obligation and through a free gift of sacrificial love, with no obligation, you are taking time out of your day on Saturday by receiving communion for someone else in the body of Christ. 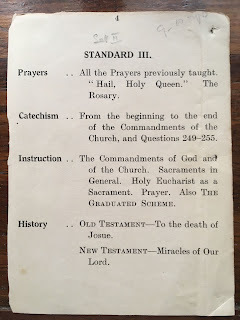 So, if you want to answer the call of Our Lady at Fatima to help someone who is in danger of spiritually drowning for all eternity, you would make a “rescue” reparation by receiving Communion, reciting five decades of the Rosary and meditating for a quarter of an hour on the mysteries of the Rosary on the first Saturday of five consecutive months. The Confession may be made during the eight days preceding or following the first Saturday of each month. Finally, I’ve created an illustrated scripture rosary page that may be helpful to you as you meditate on the mysteries of the Most Holy Rosary; you can view the page here. YCA organises devotional, catechetical and liturgical events (using the extraordinary Form of the Roman Rite, wherever possible, for Masses) so that young Catholics can discover and develop their faith.